On this page we will help you find the perfect girl monkey bedding in fabrics that will go well with pink monkey nursery decor that you buy or make yourself. Pink monkey baby bedding may not follow the color scheme originally designed by Mother Nature, but a monkey nursery decorated in pink is so cute and girly that I'm sure Mother Nature would give us a pass if we asked. Some moms choose a crib set featuring classic green jungle foliage and add pink decorations elsewhere in the nursery but for the DIY decorator that wants a room that is all girl nothing but pink will do. This approach is certainly acceptable when decorating a baby girl nursery. We, here at Unique Baby Gear Ideas are certainly willing to be broadminded and open to any concept that features cute girl monkey bedding and nursery decor in any color. It is very unlikely that (even in this modern age where genetics can be altered) will ever see a pink monkey but that won't stop us from using them to decorate kids' rooms. 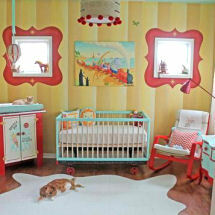 Even though Sock Monkey nurseries are cool; decorators love to try something new and different. Do you have a great set of monkey baby bedding or a picture of a nursery that you decorated in a monkey theme? Share it! Click below to see we found! Another more natural approach to girl monkey bedding and monkey theme nursery might be to take plain monkeys and give them a distinctly girlish appearance. This can be managed with something as easy as stitching some pink satin bows between the ears of the monkeys on a classic set of girl baby bedding or adding some dainty lace trim to strategic areas of the crib comforter. 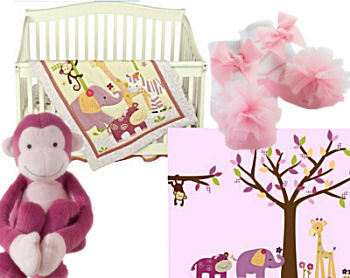 See more baby girl pink monkey bedding, curtains and nursery ideas here. Once you get the girl monkey bedding (that's so much nicer than plain old jungle baby bedding), you will need to bring the rest of your girl’s monkey nursery theme in line. My favorite idea is to dress up plush, stuffed chimpanzees in pretty dresses and shoes to reflect what you have done with the crib set. Imagine how cute monkeys dressed in ribbons, bows or a dressy evening dress complete with rhinestone tiara and jewelry will look lounging in your little girl’s bedroom. Care should be taken not to use decorations that will present a choking hazard. So, until your infant is old enough to know not to put things in her mouth use caution or arrange your decorative items high on wall shelves that are far out of reach. Visit us often to find NEW pink monkey baby bedding sets and monkey Unique Baby Gear Ideas . We have the latest decorating ideas for your baby girl’s nursery theme PLUS cute monkey decorations, area rugs and window treatments. Contact us: info@unique-baby-gear-ideas.com Copyright © 2006-2018. All Rights Reserved. When you click on links to various merchants on this site and make a purchase, this can result in this site earning a commission. Affiliate programs and affiliations include, but are not limited to, Amazon and the eBay Partner Network such as the ones to your left on this page. Please see our Affiliate Disclosure page for more information.